This is a screenshot made while ''Drive'' was still in process. 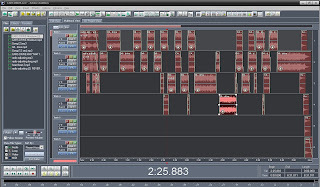 Like all my crossovers it was donr with Adobe audition and on this screensave you can see Multitrack view with ''Drive'' cutted to pieces and re-arranged. Each of this pieces was manually adjusted. I hope you can get a picture of all the work done.